Why is Old Mother Hubbard’s dog demanding organic, local food from the farmer’s market and beggings for tofu? 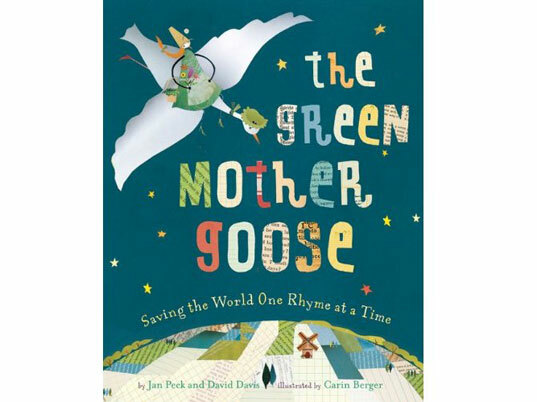 Old, beloved nursery rhymes have gotten a new eco-friendly twist in Jan Peck and David Davis’s new book, The Green Mother Goose: Saving the World One Rhyme at a Time. Whether reading about how Jack nimbly turns off the tap and the lights and dries his clothes on a line or how Mary’s once white little lamb is now black from living near a coal plant, kids will be introduced to environmental topics including solar energy and reusable shopping bags. The inventive, catchy rhymes offer positive, approachable messages about making eco-friendly choices and how kids can help Mother Earth themselves. Don’t be surprised if you find yourself singing, “This is the way we recycle our cans, recycle our cans, recycle our cans,” as you put out your own recycled goods for pick-up. Adding to the book’s appeal are Carin Berger’s fanciful illustrations, which are composed from scraps of newspapers and other recycled materials. Why is Old Mother Hubbard�s dog demanding organic, local food from the farmer�s market and beggings for tofu? Old, beloved nursery rhymes have gotten a new eco-friendly twist in Jan Peck and David Davis�s new book, The Green Mother Goose: Saving the World One Rhyme at a Time. Whether reading about how Jack nimbly turns off the tap and the lights and dries his clothes on a line or how Mary�s once white little lamb is now black from living near a coal plant, kids will be introduced to environmental topics including solar energy and reusable shopping bags. The inventive, catchy rhymes offer positive, approachable messages about making eco-friendly choices and how kids can help Mother Earth themselves. Don�t be surprised if you find yourself singing, �This is the way we recycle our cans, recycle our cans, recycle our cans,� as you put out your own recycled goods for pick-up.� Adding to the book�s appeal are Carin Berger�s fanciful illustrations, which are composed from scraps of newspapers and other recycled materials.